I have posted traditional method of making Rava Kesari already. It was such a memorable moment. My mother had come to visit me after YEARS and it was pure nostalgia. Those days I was into regular blogging and my mom jumped into the bandwagon with equal gusto. I have mentioned this countless times here, that she has sweet tooth while I am the exact opposite. So she was really disappointed at the abysmal numbers of Indian sweets in my blog and chose to rectify it immediately :grin: Now, Sooji ka Halwa (North) or Kesari /Kesari Bhath (South) is a minimally spiced semolina pudding that's sweet and creamy. Utterly simple to make, its probably the very first dessert that most Indians learn to make. This is supposed to have originated from the state of Karnataka, where the word "kesari" refers to saffron the usage of which, lends that classic golden hue to this dessert. I still remember making this during my first year of marriage - that phase when curiosity to try science like experiments with food, peaks its head. And just like any lab with success rates fighting losing battles, my kitchen that day faced an abysmal failure; all due to a mistake of adding sugar to undercooked semolina! Clearly my skills for interpreting my mother's instruction left a lot to be desired and earned a reprimand for not learning basics earlier! :-? When I tried making Rava Kesari using the OPOS method, I couldn't help but wonder how easy it would have been if there was such a thing called OPOS cooking those days? It takes out the intimidating factor of cooking thereby making it very approachable. 1. Sugar: Its my personal opinion that US sugars are milder than their Indian counterparts. That and the fact that we are abysmally low on sweet levels compared to our fellow Indians, I use 1/2 cup which as my friend calls is "Diabetic friendly" :) So if we don't share similar tastes, I would suggest using 3/4- 1 cup sugar. You can easily substitute jaggery for sugar in this recipe. 2. Semolina:You can use store bought roasted Semolina. If making at home, simply dry roast semolina for2-3 minutes in medium flame. Switch flame and let cool. Dry roast again. This double roasting is done to ensure there is no raw smell/taste. I usually make a huge batch and store in my pantry to make all dishes in jiffy without the need to roast some every time I make a dish, thereby saving time and effort. 2. Add 2 tbsp ghee and saffron. 3. Next goes in the sugar. For amount of sugar, pls refer my tips section. Combine. 4. Close the lid with weight on. Cook on HIGH for 1 Whistle ( around 5 minutes). 6. followed by a whistle within another minute. My first whistle was at 5:52 minutes. 7. Manually release the pressure using a spoon/spatula. Make sure you are not in line of the escaping steam. 8. This is how it looks upon opening. The water is still boiling. 9. Now throw in the double roasted fine Rava (semolina). 10. along with roasted cashews (and raisins if using), cardamom and salt. This little pinch of salt helps to magnify the flavors and gives it a sweeter taste without adding much sugar. 11. Combine well until no lumps remain. 12. Add in the remaining 1 tbsp ghee now. This is optional. You can add all the ghee right at step 2 itself. I feel the hot ghee on top makes for a better sensory experience. 13. Now close it back with the lid. No heating is required. What we are doing is letting the rava cook in retained heat. Let it sit for about 15-20 minutes. 14. After that time, this is how it looks. 15. A delicious bowl of creaminess all ready to be devoured. Though it gets a little firmer upon cooling, it still stays quite creamy for a long time. 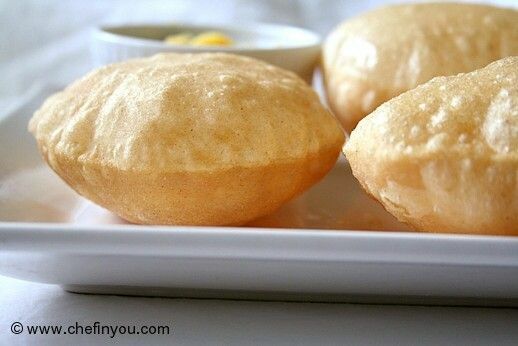 Serve it warm, serve it cold, as it is, or with poori (halwa poori is a fabulous combo!) or as a part of a combo platter. Its just perfect and is very complimentary to almost any Indian meal. Hi Why is salt added in Kesari?